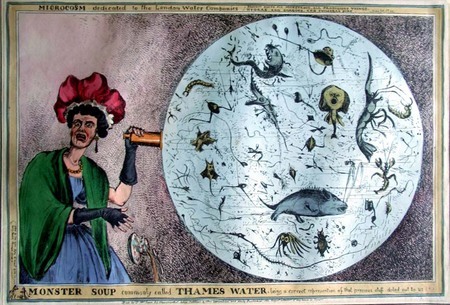 William Heath (1794/95-1840), Monster Soup Commonly Called Thames Water, Being a Correct Representation of that Precious Stuff Doled Out To Us!!! [Above the design:] Microcosm, dedicated to the London Water Companies, Brought Forth All Monstrous, All Prodigious Thigs [sic], Hydras, and Gorgons, and Chimeras Dire. Vide Milton. [‘Paradise Lost’, ii. ], ca. 1828. William Heath, The Beau Monde. 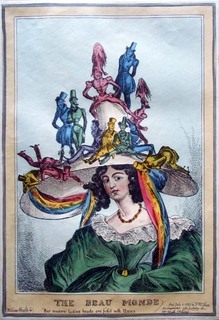 “Our modern ladies heads are fill’d with bows.” July 6, 1829. 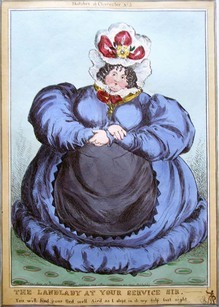 Princeton recently acquired a unique compilation of caricatures organized by one of Heath’s publishers, Thomas McLean, in the early 1830s. 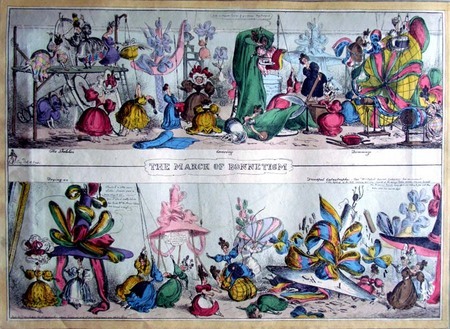 The album includes approximately sixty hand-colored caricatures, most by Heath but also a handful by Robert Seymour, Michael Egerton, Robert Cruikshank, and another unidentified artist. McLean sold many versions of these albums, each with its own decorative letterpress title page. 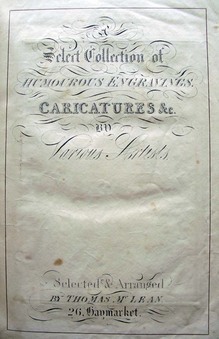 This one reads: A Select Collection of Humourous Engravings, Caricatures, &c. by Various Artists Selected and Arranged by Thomas McLean. 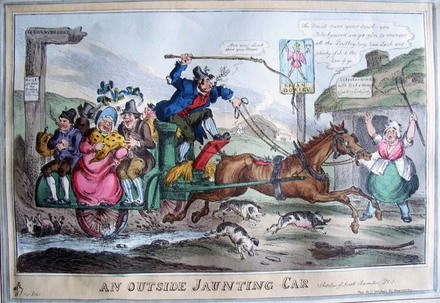 William Heath, The March of Bonnetism, ca. 1828. William Heath, The Landlady at Your Service Sir, You Will Find Your Bed Well Air’d as I Slept in it Myself Last Night (from the series: Sketches of Character, plate 5) ca. 1829. Attributed to William Heath, The Wish Granted. 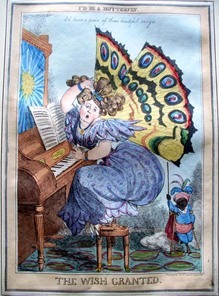 [above design]”I’d be a butterfly,” 1820s. Note the same carpet in both prints. I am working on a catalogue raisonné of William Heath, including his prints, drawings, and illustrated books. Here’s a first draft (pdf). If anyone would like to comment or correct, I’d be glad to hear from you.